When my children were young we used to gather colorful leaves and iron them between pieces of waxed paper to preserve them. There is something magical about the wonderful colors of fall leaves. They are everywhere, now, and people echo their beauty with doorstep pots of chrysanthemums in yellow, red, gold and rust. When I was growing up people didn’t decorate for fall or Halloween. People gave parties—I remember one year my parents gave one for adults. This was once also a popular time for divination games, which often centered around finding one’s true love. 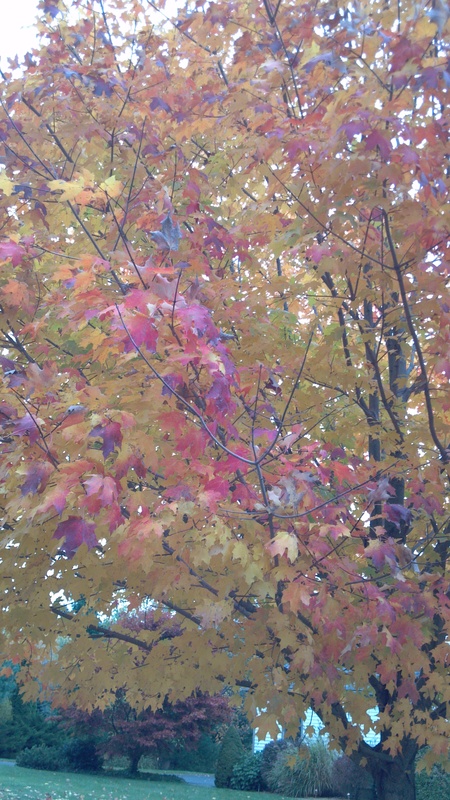 I am enchanted by the colors of the trees at this time of year. I could almost believe that if I were pulled over by a policeman I might appear intoxicated. That’s a joke, of course, as for many years my body has not tolerated more than a sip or two of alcohol, and that only on rare occasions. No, what I would be drunk on is the beauty that glows along the roadsides. As I drive around on my errands these days, the slanting rays of the autumn sun shine through the reds and golds of the turning leaves, leaving me breathless. I feel fortunate that I have the eyes to see it and the heart to appreciate it. I remember a conversation I had once with someone who was chronically depressed. When I said something about the beauty around us she shrugged and told me she couldn’t really appreciate it. Although she didn’t say it I could tell that she was simply too sad to do so. Her mind was totally preoccupied with her troubles and sorrows. I felt for her. The gorgeous display that is the essence of a fall in New England is something many people travel here to see. It’s one of the reasons I prefer to live in this part of the USA. Nearly thirty years ago, before we moved to Grafton I spent seven years in Virginia. While we were there I found that the leaves that turned did not do so with much intensity, and I missed the brilliance of our autumn very much. When a great many years ago I was in southwest Texas in the fall I felt the same. I was three I have lived here in New England since I was three years old, and perhaps it is in my blood. 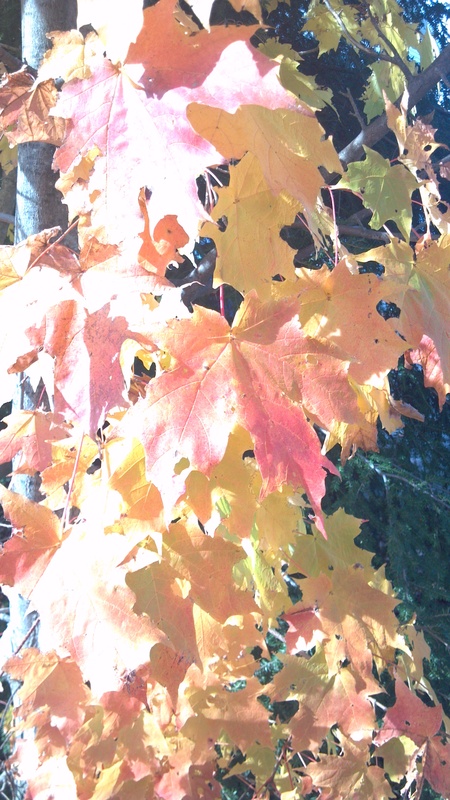 One thing is sure: each year I look forward eagerly to the changing of the season and the beautiful colors. One of the houses we lived in had a window that looked out over a very special Maple tree. 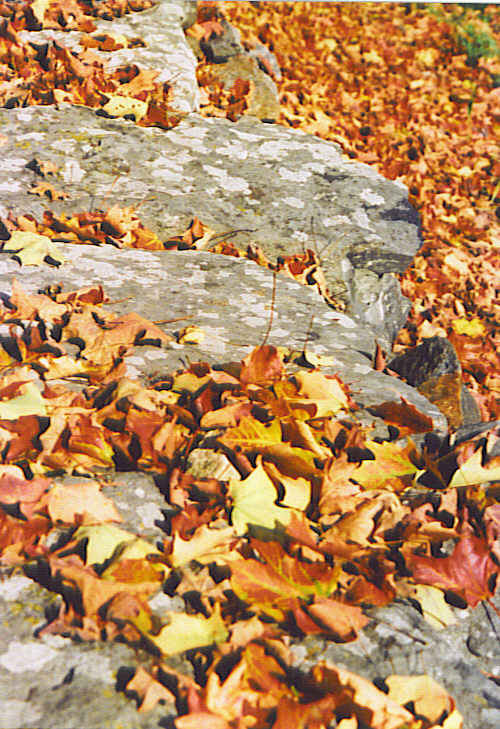 The colors that brightened the leaves would begin with a single branch, sometimes as early as late August. How I enjoyed it when that patch of leaves burst into color. The loveliness of nature in autumn warms my heart in a way that enlivens my whole being. I am so very thankful for this special gift of loveliness, free for the gazing, billowing over the hills and presenting on yards: our New England fall. 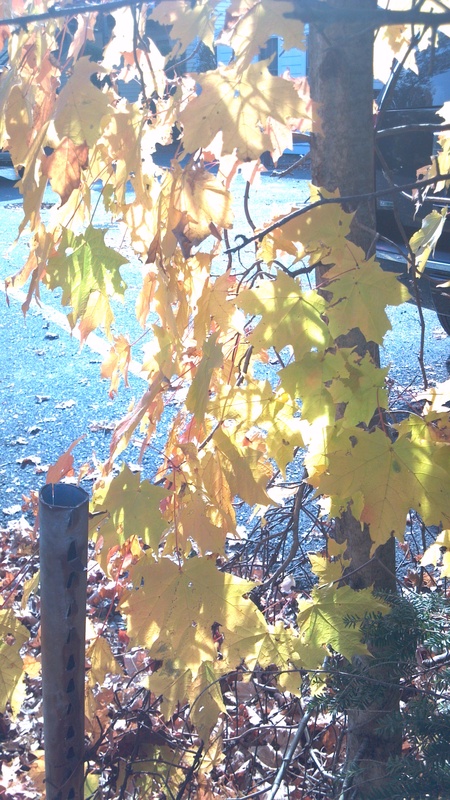 The maple tree outside my window has been late in turning. I worried the leaves might fall off before they changed color. Then one morning as I pulled the curtain aside I saw they had indeed made their transition to gold. Later in the day the sun shone through them and the brilliance of the leaves was a sight to behold. I stood gazing at them, grateful for the beauty of that moment and of the very special loveliness that is fall in New England. I feel fortunate to have grown up in this beautiful part of the country. Fall has always been special to me. I remember as a child collecting bright leaves and ironing them between pieces of waxed paper to preserve their colors. I did the same with my children when they were small, and we would hang the leaves up in a window to let the light shine through them. When I went thorough my mother’s correspondence amongst the letters was one from me with some colorful leaves. Being in Florida she said she missed them, so I sent her some. Lately driving on the country roads near where we live I find it difficult to keep my eyes on the road. The scenery is breathtaking. The foliage of the trees makes billowing waves of color; the rounded mounds of the distant leaves heaped one upon the other simply take my breath away. How easy it might be to get lost in my inner dialogue and miss this. My mind, like most has a way of getting busy with thoughts concerning what is or is not to be done, or has or hasn’t been finished. Lately I’ve improved. I used to find myself making lists in my head and missing out on a lot of what I might have appreciated had my eyes had been focused outward rather than inward. Once I got into the habit of noticing what my mind was doing it became easier to tame its tendency to run away with my attention and keep me from seeing what was happening around me. When I take the time to look there is always something interesting to see. Naturally when I am driving I must keep some of my attention focused on what I am doing. Providentially, while looking to the road itself I see what is in front of me. Too, when I am with someone if I pay attention to what he or she is saying or how they are feeling instead of thinking about what I am going to say next, it is much easier to be fully present and aware of my companion. I’m coming up on a birthday this month, and what I realize about getting older is that it gets easier each year to be patient, to be aware, and to be present insofar as I am able. For this I am thankful. I may never know what I have missed in the past when my mind wandered off and took my attention with it, yet I can make it a practice to keep myself in the here and now. That way I can appreciate whatever there is to be enjoyed in any given moment. Fall in its variety fills the air with bright, brimming over with an ecstasy that brings us joy.. The light shines upon the leaves and it reflects into our hearts. Then the leaves dance and their brightness makes us sing. Singing fills the air; light glistens echoing our song. Until we too sigh and sweetly lie down to rest.